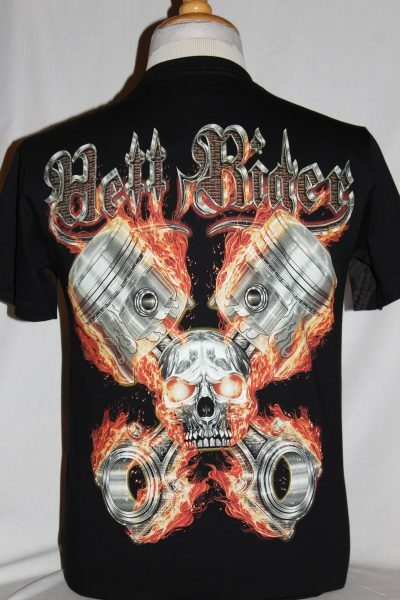 The Demon Biker Babe T-Shirt is a two sided print in black. 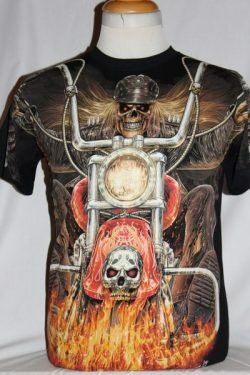 Front Design: Biker Babe on Custom Harley with a flame scene superimposed. Back Design: Same as the front design. This product features a glow in the dark images. The shirt tag lists the proper cleaning instructions. Jay's Rock 100% heavyweight cotton, 6.1 oz., preshrunk t-shirt. This shirt has double-needle stitching throughout; seamless rib at neck; shoulder-to-shoulder tape. This shirt will wear well and retain its original color and decoration after multiple washings.